The Australian Constitution allowed for a national capital, and a capital territory, to be created. The Constitution underpinned Federation in 1901. 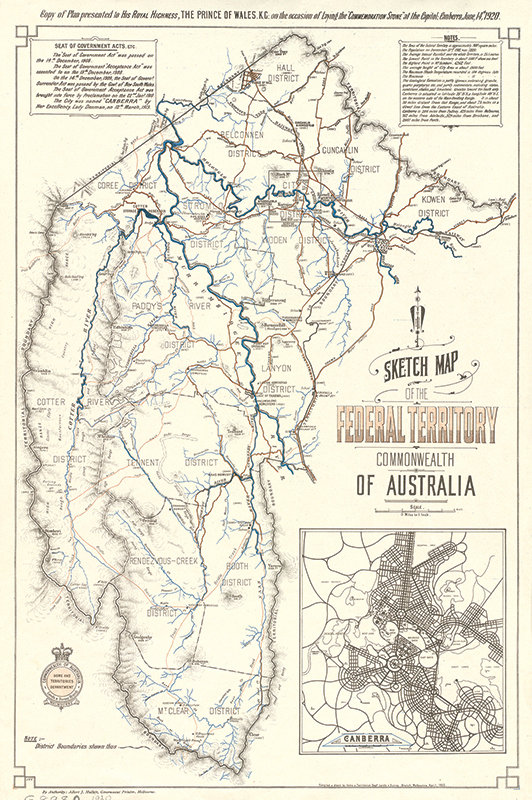 The Australian Capital Territory (originally Federal Capital Territory) came into being following the decision to site the national capital in the Yass-Canberra area in 1908. NSW surveyor Charles Scrivener was commissioned by the Federal Government to advise on where the city might be located and where the territory border should run. In determining the latter, Scrivener was guided particularly by the government’s desire to protect the city’s water supply by incorporating the water catchment within the territorial border. Scrivener and other members of an advisory board first suggested a horseshoe-shaped territory incorporating the Queanbeyan and Googong areas but after discussion with the NSW Premier certain adjustments saw the border evolve to the shape we know today. The definition of the border was contained in legislation passed in 1909 and which came into force in 1911. It had been agreed between the Federal and NSW governments that the border, as physically marked on the ground by surveyors working under Scrivener, would be the agreed line. Beginning in 1910, Surveyor Percy Sheaffe commenced the task and he surveyed over 180 km of the 306 km border. Surveyor Harry Mouat surveyed over 90 km of the border, and third surveyor Frederick Johnston surveyed nearly 30klms. The survey was completed in 1915. The border was marked at each point where it changed bearing, at mile points and at certain other points. Survey marks included timber posts, concrete-filled downpipes and other pipes, concrete cylinders, spikes set in concrete, and other marks, each with a line of stones or lockspit indicating the bearings at the mark. Wherever possible, surveyors hand-chiselled engravings into a nearby tree (known as a reference tree) which referred to the mark, so that the mark could be found in future, or reinstated if lost. The engraved inscriptions usually include the Commonwealth survey arrow, the letters CT (Commonwealth Territory) and in the case of mile trees, the number of miles from the beginning of the survey at Mt Coree. Detail from FC 18 map series showing survey mark H87 on the southern ACT Border (Courtesy ACTPLA). The Mouat Tree is one of those engraved by surveyor Mouat during the border work and was engraved by him and his team in autumn 1915. Today, these trees represent a very real connection in time with the birth of the ACT, and the hand-inscribed nature of the blazes is an engaging feature for interpretive purposes. The original Mouat Tree in situ prior to its relocation to the Namadgi National Park Visitor Information Centre (Image courtesy of Matthew Higgins). Mouat’s fieldbook A1059 showing mark H87 and reference tree (Courtesy ACTPLA). Of those surviving a century later many are in poor condition with illegible engravings. In a decade from now few if any of the surviving border reference trees will exist. Time has and will continue to take its toll. From deep in the southern ranges of Namadgi National Park the trunk of one of the surviving border marker reference trees has now been salvaged – air-lifted out by helicopter complete with its distinctive ‘blaze’. This iconic historic symbol, now known as ‘The Mouat Tree’, has been relocated to the grounds of the Namadgi National Park Visitor Information Centre, Tharwa. Under the stewardship and guidance of Canberra Museum and Gallery (CMAG), this relic is now receiving conservation treatment, preserving its intrinsic heritage values as the basis of an exciting interpretive structure.